Building Design+Construction wrote about DPR's charitable arm, DPR Foundation. Established in 2008, DPR Foundation has awarded nearly $1.5 million to 17 different organizations over the past four years and is committed to helping disadvantaged youth within each of DPR's local communities by supporting youth-focused organizations. For 2011-2012, DPR Foundation will be giving away $590,000 to 9 returning grantees and 3 new youth organizations for disadvantaged grade school to high school youths. DPR's LEED Platinum, net zero San Diego office building is setting a new standard for the region. The only office building in the city to achieve those 2 green achievements, DPR's 24,000-sq.ft. facility actually generates energy to put back into the grid. Read about it all here. UCSF's 878,000-sq.-ft., $1.5 billion Mission Bay Medical Center project is stimulating the economy--including DPR's, according to the San Francisco Business Times. The article discusses DPR's involvement with the mammoth project and company growth. It also features an interview with Mike Humphrey, DPR's General Manager for the firm’s San Francisco office. In Seoul, Korea, DPR Executive Vice President Eric Lamb met with Korean builder, GS Engineering & Construction (E&C). E&C signed an agreement with DPR Construction on bilateral collaboration on Building Information Modeling. The BIM agreement was signified in a signing ceremony at the E&C's headquarters. Here's to a great partnership! DPR Model Slicer v2, a free Autodesk® Revit® Architecture plug-in, has just been released and is now available for download here. 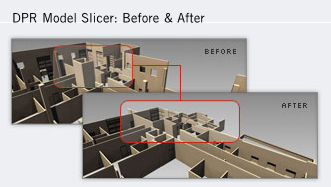 Compatible with Revit 2010, 2011, and 2012, the DPR Model Slicer facilitates the creation of 3D building sections or “slices” from a Revit model, providing a faster way to section a model by individual floors or gridlines. Version 2 of the plug-in incorporates many oft-requested features and improvements from the first version. Metric support is now available for non-US users. Also, users will now have the ability to utilize building gridlines to not only slice the model by level, but also into sub-sections. In addition, functions such as category selections, export formats, and overall performance are also improved. There's a lot to "like" at DPR right now! DPR is honored to be selected to construct Facebook's new data center in Lulea, Sweden. The 300,000-sq.-ft. data center will be constructed though a a joint venture between NCC Construction Sweden and Fortis Construction in Portland, Oregon. Aiming for LEED Gold and planned for completion in December 2012, this is the first of three data centers planned for the area. The UCSF Medical Center at Mission Bay project reached an important milestone. Abuzz with excitement, DPR celebrated the topping out of the $1.5 billion, 289-bed campus. This signifies the completion of structural steel erection. On track to open in 2015, the 878,000-sq.-ft. medical facility is aiming for LEED Gold and consists of 3 hospitals. Congrats to the team, keep up the great work! To see what Medical Construction & Design magazine wrote about this achievement, click here. Nearly one year after breaking ground on the $1.5 billion, 878,000-gross-sq.-ft. project, the team will celebrate with a traditional topping out ceremony, where a beam signifying the end of the structural steel erection will be put in place. 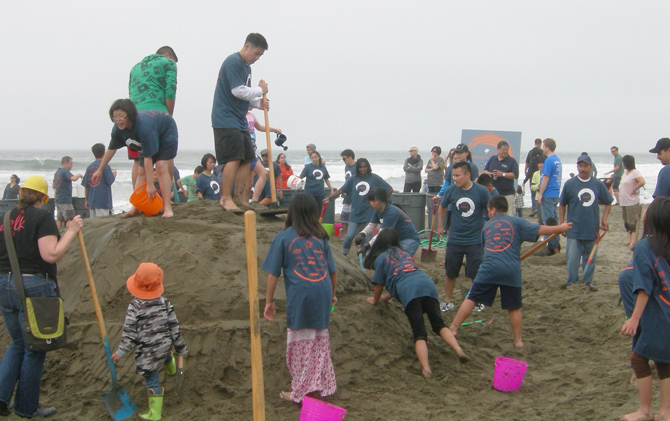 DPR’s Bay Area regional offices competed in the 28th annual LEAP Sandcastle Competition Saturday, October 8, 2011. DPR’s two teams competed against 20 other teams of contractors teamed with architects and schools. The teams arrived around 7:30 a.m. and didn’t leave until the results were announced at 4 p.m. After a long day of shoveling sand and helping raise money for a great organization, DPR’s teams won the Best Integration of Theme award and the Best Participation of Leap Kids award and most importantly, had a great time. DPR will continue to support Leap’s efforts to stimulate imagination and creativity in Bay Area children by bringing visual and performing artists and architects into the classroom for extended residencies, interweaving all aspects of learning in with the creative process. Leap was established in 1979 as a response to the passing of California Proposition 13, which dramatically reduced state funding for education and effectively eliminated the art from public elementary schools. Work is underway at the DPR Boutique, our future Phoenix headquarters as well as the first building in Arizona on target to operate at Net Zero efficiency. This means our building will generate as much or more energy than it consumes. 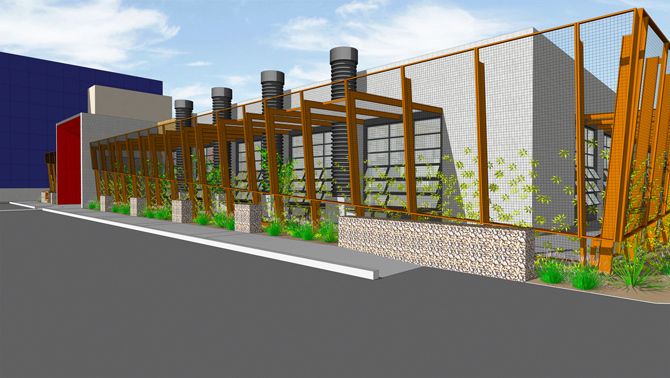 When this adaptive reuse project is complete, the DPR Boutique will be a living laboratory for our company. Visitors will see first hand how we implemented LEED features, renewable energy generation systems and sustainable construction practices to create a comfortable and functional interior environment for our employees. With only a few weeks before we open in October, we want to share our progress. Check back on the DPR blog for videos from the project team covering milestones, structural features and the process of becoming Net Zero. Our hope is to inspire, educate and encourage our clients and the greater community to live and work more sustainably in the Arizona desert environment.